Leonard, David W.. "Peace River (Alta)". The Canadian Encyclopedia, 12 May 2016, Historica Canada. 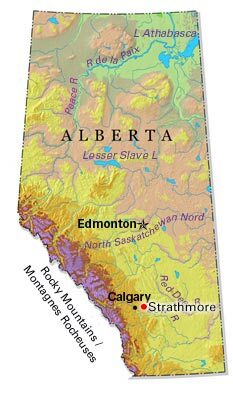 https://www.thecanadianencyclopedia.ca/en/article/peace-river-alta. Accessed 20 April 2019. Peace River, Alta, incorporated as a town in 1919, population 6744 (2011c), 6315 (2006c). The Town of Peace River is located near the confluence of the PEACE and Smoky rivers. Peace River, Alta, incorporated as a town in 1919, population 6744 (2011c), 6315 (2006c). The Town of Peace River is located near the confluence of the PEACE and Smoky rivers. It was next to this confluence that Alexander MACKENZIE and his party wintered at a site they called Fort Fork during their famous journey to the Pacific Ocean of 1792-93. Where the north Heart River flows into the Peace, a community called Peace River Crossing evolved at the end of the 19th century. This was the terminus of a trail from GROUARD, over which most visitors to the Peace River Country then travelled. In 1898 a NORTH-WEST MOUNTED POLICE post was erected there, and in 1899 Treaty 8 was concluded with the resident Cree. 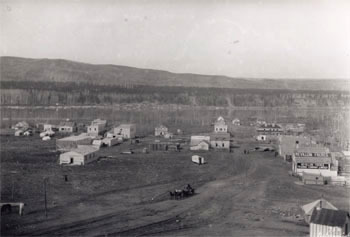 A land rush lead to the establishment of the village of Peace River Crossing in 1914, soon after to be renamed Peace River (courtesy Glenbow Archives/NC-6-756). With HOMESTEADING beginning, the government built a ferry at the Crossing in 1909 and subdivided the Peace River Landing Settlement. A land rush followed, and in 1914 Peace River Crossing became a village, to be re-named Peace River in 1916. In 1916 the Central Canada Railway arrived, and in 1919 a rail and traffic bridge was built across the Peace. 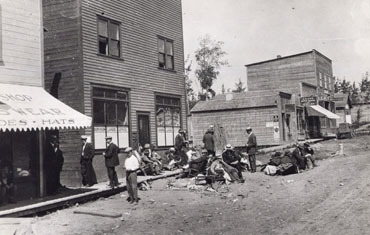 With an oil boom then underway, Peace River became a town. The oil boom soon subsided and Peace River continued as a northern farming center, a role it maintains today. The economy was bolstered by the building of the ALASKA HIGHWAY in the 1940s and the establishment of a Daishowa Forest Products (now Daishowa-Marubeni International Ltd) plant in the late 1980s. The history of Peace River and its hinterland is well illustrated by the exhibits at the Peace River Centennial Museum, while high on a hill overlooking the town and a spectacular view to the southwest is the grave of the famous fur trader, Henry Fuller (Twelve Foot) Davis. Sir Alexander Mackenzie Historical Society, Peace River Remembers (1984). Peace RiverOfficial web site of the Town of Peace River, Ab.